If you're a fan of 80s style rock/metal you will enjoy this album of Christ-honoring hard rock songs from Pastor Brad. Every song is loaded with hooks, riffs, stacked (80s rock) vocal choruses, shredding guitar leads etc. All the things fans of 80s metal and arena rock much love! Enjoy! Star Wars Imperial March (Hard Rock) "Darth Vader Theme"
Star Wars – The Imperial March – Darth Vader’s Theme (Rock Version) Pastor Brad is, exactly as the title suggests, a rock version of the famous Start Wars Imperial March theme song – fleshed out with drums, bass and electric guitars. Fans of the traditional Imperial March theme song will definitely find lots to like about this rock version—as it still contains much of symphonic elements like soaring violins and deep rumbling cellos. I’ve always found this song to be very evocative and I am pleased that my rock version maintained that element of emotion. I grew up with the Star Wars Saga as a rich part of my culture. The good vs. evil, light vs. darkness themes that saturate the story provide tons of fodder for Christian discussion---and let's face it--the movies are flat awesome! So, I hope you enjoy my hard-rock version of the classic Star Wars Theme song! Hey man, if you grew up around the time that I did--you LOVE the Peanuts Christmas Special---and of course, this song: "Linus & Lucy" was the theme song. I hope you have a very merry Christmas and may this instrumental rock version of this class Christmas song Rock You Up! Rip Tide is an 80s Christian metal hard rock onslaught of faith, hope and love! Rip Tide is an 80s style Christian metal message. It reminds us that there are dark and evil forces in this world that want to pull us down, pull us under like a “rip tide” and kill us, but Jesus is our Savior—He is our deliverer, in Him we have the strength to be more than conquerors in any and every circumstance. If you love Jesus and enjoy hard rock riffs, heavy metal guitar leads and thunderous bass and drums blended with Christian lyrics/vocals belted from the heart—you will totally dig this 80s Christian Metal Anthem! HEAVEN is an onslaught of 80s Christian Metal love, power and encouragement! It rocks… hard… straight out of the gate – with an uplifting message of victory in Christ that hits you right in the heart and lifts your faith up high and Jesus up HIGHER! If you’re a fan of classic, 80s style hard rock/metal music that glorifies Jesus—you will totally dig this song! My Jesus is an 80s Christian metal hard rock onslaught of faith, hope and love! This song is a response to a pet peeve of mine—it bothers me when people throw the phrase “my Jesus” around, like they’ve created Him in their image and they get to define what it right and wrong based on their own world view—instead of bowing to Christ as the Lord of lords and King of all kings. If you love Jesus and enjoy hard rock riffs, heavy metal guitar leads and thunderous bass and drums blended with Christian lyrics/vocals belted from the heart—you will totally dig this 80s Christian Metal Anthem! Justified is a massive 80s Christian Metal Message of encouragement! It rocks… hard… straight out of the gate – with an uplifting message of victory in Christ that hits you right in the heart and lifts your faith up high and Jesus up HIGHER! If you’re a fan of classic, 80s style hard rock/metal music with lyrics that honro Christ and will Rock You Up in your faith--you're gonna love this tune! hat glorifies Jesus—you will totally dig this song! The PB Rocks 80s Christian Rock / Metal Music Podcast is a show dedicated to Rocking Listeners Up for Jesus. It’s jam-packed with Christ-honoring hard rock music and bible teaching encouragement for your Christian faith! In this episode, Pastor Brad shares three tracks from his 2017 80s Christian Metal Album, “CRUSH” – Track 04 Mean Machine, Track 05 Mighty Fortress & Track 06 Your Love. This podcast also includes a very special piece of Pastor Brad’s testimony, titled “How God Changed My Life.” It’s all about how God uses painful moments to deepen our walk with Him! Doctor Of Love is an 80s Christian Blues-Metal Message of hope and redemption! It rocks… and rolls… and grooves… straight out of the gate – with an uplifting message of victory in Christ that hits you right in the heart and lifts your faith up high—and Jesus up even HIGHER! If you’re a fan of classic, 80s style hard rock, blues and metal music that glorifies Jesus—you will totally dig this song! Shredded Sweet, Pastor Brad’s 2007, Instrumental Rock / Metal / Shred Guitar Music Album is an eclectic collection of riffs, beats, leads, tricks, grooves and flat-out shred guitar mania. If you enjoy instrumental rock guitar music you will totally dig this album! Fans of instrumental rock guitarists like Yngwie Malmsteen, Joe Satriani, Steve Vai, Tony MacAlpine, Joe Stump, etc. will thoroughly enjoy the SHRED album! Holding Me Together is an 80s Christian metal hard rock onslaught of faith, hope and love! It’s in Christ that all things hold together (Col. 1:17) – including our lives! If you love Jesus and enjoy hard rock riffs, heavy metal guitar leads and thunderous bass and drums blended with Christian lyrics/vocals belted from the heart—you will totally dig this 80s Christian Metal Anthem! This video is part 4 of my four-part youtube release of the "Pastor Brad Essentials 2003-2011" collection. "He Loves Me" features Mr. Les Carlsen (Bloodgood) on lead vox--that was a dream come true for me--to work with Him. If you love Jesus and hard rock, 80s style metal--I think you 'll enjoy this collection! Get Away is an 80s Christian metal hard rock onslaught of faith, hope and love! It’s expressing a longing all Christ followers have for the day Jesus will return to bring us home and make all things right! If you love Jesus and enjoy hard rock riffs, heavy metal guitar leads and thunderous bass and drums blended with Christian lyrics/vocals belted from the heart—you will totally dig this 80s Christian Metal Anthem! Thirsty is an 80s Christian metal hard rock acoustic, thought provoking song of faith, hope and love! Jesus declared---“All who are thirsty—come to me and drink!” Jesus wants to quench the deepest heart thirst in your life with His grace and love! If you love Jesus and enjoy hard rock riffs, heavy metal guitar leads and thunderous bass and drums blended with Christian lyrics/vocals belted from the heart—you will totally dig this 80s Christian Metal Anthem/ballad! The Pastor Brad Essentials album/collection is an 80s Christian metal hard rock onslaught of faith, hope and love! In total there are forty songs in this greatest hits collection. If you love Jesus and enjoy hard rock riffs, heavy metal guitar leads and thunderous bass you will totally dig this full album of 80s Christian Metal Anthems! Your Love is an 80s Christian metal anthem about the amazing, inexhaustible, unstoppable, unquenchable love of God and our endless need for more and more and more of it! If you're a fan of 80s Hard Rock or Metal music & you love Jesus--this song will totally Rock You Up, enjoy! 8The Mighty Fortress mini rockumentary is an 80s Christian metal behind the scenes look at this hard rock declaration that A Mighty Fortress is our God! Martin Luther was right when he penned that classic hymn hundreds of years ago. In this video you’ll get a behind the scenes look at the biblical truths and life experiences that inspired this song. If you love Jesus and enjoy hard rock riffs, heavy metal guitar leads and thunderous bass and drums blended with Christian lyrics/vocals belted from the heart—you will totally dig this 80s Christian Metal Anthem! Mighty Fortress is the 80s Christian metal cousin of Martin Luther’s classic hymn, A Mighty Fortress Is Our God! This song proclaims a very similar message of hope in Christ—but with a heavy metal edge. If you love hard rock riffs, heavy metal guitar leads with Christian lyrics/vocals belted from the heart—you totally dig this 80s Christian Metal Anthem, Mighty Fortress! Skipping Along is a track from my 2005 instrumental rock guitar album, SHRED. If you enjoy instrumental hard rock music played with skill and melody—packed with lead guitar tricks, licks, riffs and runs you will enjoy this music. 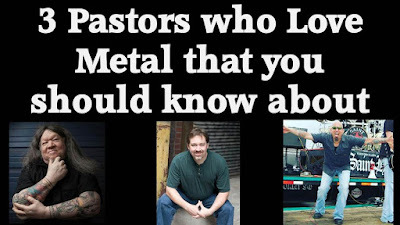 If you love Christian metal music, you will love this Pastor Brad interview of Chris Suit of Metal Cross. It’s filled with inspiring testimony and insights about how God is using Christian metal to touch lives and draw people toward faith in Jesus Christ. In this video Chris shares the story of how Metal Cross came to be. Brad and Chris also explore questions like, “Is Christian metal evil?” “Is Christian metal really Christian?” “Is Christian metal wrong?” The discussion covers a lot of ground. You’ll see clips of interviews with many contemporary Christian metal bands and Brad and Chris celebrate the golden age of metal music—the 1980s—80s Christian Metal Rules!  If you’re a fan of 80s Christian metal music, or any form of heavy music in general, I think you’ll enjoy and be encouraged by this interview! Next time you shop @ Amazon--Click on this banner to go there! Thanks! The Holding Me Together mini rockumentary is an 80s Christian metal behind the scenes look at this hard rock prayer for Christ to make all things right! You’ll get a behind the scenes look at the biblical truths and life experiences that inspired this song. If you love Jesus and enjoy hard rock riffs, heavy metal guitar leads and thunderous bass and drums blended with Christian lyrics/vocals belted from the heart—you will totally dig this 80s Christian Metal Anthem! Holding Me Together is an 80s Christian metal music mantra. It’s all about the reality that IN CHRIST all things hold together… including me! I would have fallen apart a long time ago if it weren’t for the grace of God. If you enjoy hard rock rhythms, heavy metal riffs and melodic guitar solos and vocals---I think you’ll really enjoy this video! Join the NEW PB 80s Christian Metal Facebook Group! Memory Lane is a track from my 2007 instrumental rock guitar album, SHREDDED SWEET. Memory Lane is a mid-tempo-straight ahead shred-rocker jam-packed with melodic licks, riffs, trills & all around good clean face-melting shred guitar carnage. If you enjoy instrumental hard rock music played with skill and melody—packed with lead guitar tricks, licks, riffs and runs you will enjoy this music. The Get Away mini rockumentary is an 80s Christian metal behind the scenes look at this hard rock prayer for Christ to make all things right! You’ll get a behind the scenes look at the biblical truths and life experiences that inspired this song. If you love Jesus and enjoy hard rock riffs, heavy metal guitar leads and thunderous bass and drums blended with Christian lyrics/vocals belted from the heart—you will totally dig this 80s Christian Metal Anthem! Get Away is an 80s Christian metal music mantra. It’s all about the brokenness of this world, desiring to be set free from it and the reality that one day – in Christ – ( (and all who trust Jesus as Lord and Savior) will be! So, if you enjoy 80s style Christian metal music that’s packed with hard rock rhythms, heavy metal hooks and melodic metal leads and vocals---I think you’ll really enjoy Get Away. Thanks for watching/listening! Childlike Sweetness is a track from my 2007 instrumental rock guitar album, SHREDDED SWEET. Childlike Sweetness is an up-tempo-straight ahead shred-rocker jam-packed with melodic licks, riffs, trills & all around good clean face-melting shred guitar carnage. If you enjoy instrumental hard rock music played with skill and melody—packed with lead guitar tricks, licks, riffs and runs you will enjoy this music. Fans of hard rock & metal will enjoy the riffs and driving rhythms that saturate this instrumental, shred guitar music from start to finish. And fans of instrumental rock guitarists like Yngwie Malmsteen, Joe Satriani, Steve Vai, Tony MacAlpine, Joe Stump, etc. will thoroughly enjoy this album! 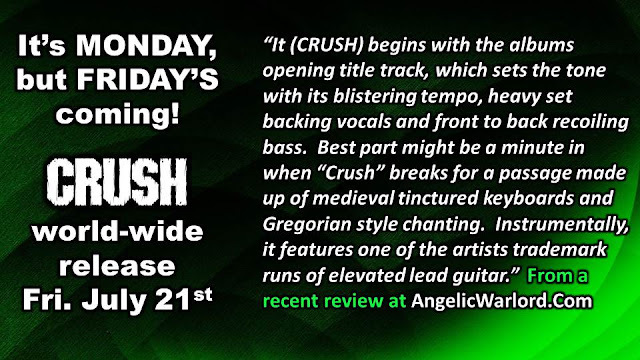 The CRUSH mini rockumentary is an 80s Christian metal behind the scenes look at this slamfest of a song titled, CRUSH! You’ll get a behind the scenes look at the biblical truths and life experiences that inspired this song. If you love Jesus and enjoy hard rock riffs, heavy metal guitar leads and thunderous bass and drums blended with Christian lyrics/vocals belted from the heart—you will totally dig this 80s Christian Metal Anthem! FA 2 is a track from my 2005 instrumental rock guitar album, SHRED. It’s essentially an instrumental version of Fatal Attraction (from The King Has Come 2005). If you enjoy instrumental hard rock music packed with lead guitar tricks, licks, riffs and runs you will enjoy this music. Credit to Jon Hooper and Any England who both lay some killer leads on this track! 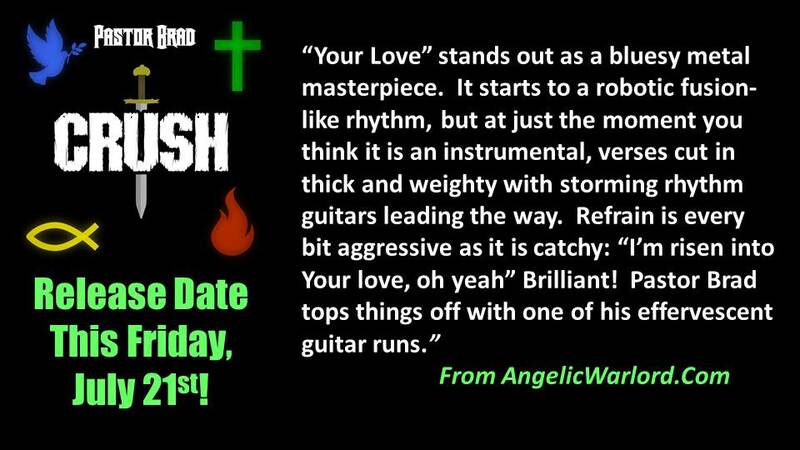 The CRUSH Album Release Party is a celebration of 80s Christian Rock / Metal Music! This is my 16th full-length Pastor Brad album! Ten brand new Christian metal songs all designed to Rock You Up for Jesus! It’s a celebration—I hope you enjoy it! Grab a cup of coffee or a snack and settle in for nearly an hour of inspiration and head-banging praise, worship and testimony! Prepare to be CRUSHED by an onslaught of love, grace, encouragement, blessing, challenge and faith building truth! Have A Good Weekend was an experiment I did with David Jacob. He send me an acoustic piece he'd created--and I thought it was very cool... I also thought I might be able to "rock-it-up" a bit by adding drums and electric guitars. NOTE this was waaaaaaaaaaaay early in my recording days--I was very naive and green in terms of HOW to use my DAW, etc. Nevertheless we dove in and had fun with it. The two cameo voices you hear were both taken from phone messages--the first voice is my sister in law Lynn Barclay Olivera and the second is my brother, Brent Windlan. Enjoy! A Fresh & Massive Dose of 80s Christian Metal is coming your way this Friday, July 21, 2017! A Fresh & Massive Dose of 80s Christian Metal to Rock You Up for Jesus hits the world's stage THIS FRIDAY, July 21 (2017)! I'm so excited to share this with you. Whether you're a Spotify listener or enjoy getting your music from Amazon, Bandcamp, iTunes or wherever---CRUSH will be there waiting for you to press play and be Rocked Up, enjoy! Here’s some instrumental rock/metal shred guitar music to Rock You Up! Soul Life is a track from my 2007 instrumental rock guitar album, SHREDDED SWEET. Soul Life is a steady-straight ahead shred-rocker jam-packed with melodic licks, riffs, trills & all around good clean face-melting shred guitar carnage. If you enjoy instrumental hard rock music played with skill and melody—packed with lead guitar tricks, licks, riffs and runs you will enjoy this music. It's Monday, but Friday's Coming--CRUSH is released July 21st! SUPPORT GuitarJams.Net! Next time you shop @ Amazon--Click on this banner to go there! Thanks! Upside Down is an 80s Christian metal hard rock onslaught of faith, hope and love! Jesus taught about a new way of living, a Kingdom life, one that is totally upside down from the ways of this world---a life where the greatest among us are the servants—where the last shall be first and the first last. If you love Jesus and enjoy hard rock riffs, heavy metal guitar leads and thunderous bass and drums blended with Christian lyrics/vocals belted from the heart—you will totally dig this 80s Christian Metal Anthem! Sinai Daydreams swings from siren acoustic melodies—all thanks to the word of Mr. David Jacob on acoustic guitar—to galloping Iron Maiden style hard rock rhythms and face melting shred guitar riffs. If you enjoy instrumental hard rock music played with skill and melody—packed with lead guitar tricks, licks, riffs and runs you will enjoy this music. Here’s some instrumental rock/metal shred guitar music to Rock You Up! Fire & Ice is a track from my 2007 instrumental rock guitar album, SHREDDED SWEET. Fire & Ice is an up-tempo hard rocking blend of driving rhythms and face melting shred guitar riffs. If you enjoy instrumental hard rock music played with skill and melody—packed with lead guitar tricks, licks, riffs and runs you will enjoy this music. Happy 4th of July 80s Christian Metal Pastor Brad Style! July 4th & Independence Day -- Freedom in Christ - 80s Christian Metal! In this video Pastor Brad (of http://www.guitarjams.net) draws a parallel between the freedom we celebrate each Independence Day, and the freedom we enjoy as followers of Christ! Shredded Sweet is a track from my 2007 instrumental rock guitar album, SHREDDED SWEET. It’s an up-tempo hard rocking blend of driving rhythms and face melting shred guitar riffs. If you enjoy instrumental hard rock music played with skill and melody—packed with lead guitar tricks, licks, riffs and runs you will enjoy this music. Rock-On friends! Forbidden Fruit is an 80s Christian Rock / Metal track from my 2004 demo, Rock You Up. Forbidden Fruit is a fervent 80s style metal musical declaration of Scriptural Truth, hope and faith in Jesus Christ. Some scripture passages that inspired this song include Genesis 3, James 1 and 1 Cor. 10:13. If you’re a fan of 80s Christian metal or rock music you will enjoy Pastor Brad’s Christian rock music! SUPPORT GuitarJams.Net! Next time you shop @ Amazon--Click on this banner to go there! Rolling Thunder is a track from my 2007 instrumental rock guitar album, SHREDDED SWEET. It’s an up-tempo hard rocking blend of driving rhythms and face melting shred guitar riffs. If you enjoy instrumental hard rock music played with skill and melody—packed with lead guitar tricks, licks, riffs and runs you will enjoy this music. Special Thanks to Sonny Lombardozzi who shreds on solo two! Bed of Roses is a track from my 2007 instrumental rock guitar album, SHREDDED SWEET. It’s a mid-tempo hard rocking blend of groove, rhythm, and face melting shred guitar riffs. If you enjoy instrumental hard rock music played with skill and melody—packed with lead guitar tricks, licks, riffs and runs you will enjoy this music. Fans of hard rock & metal will enjoy the riffs and driving rhythms that saturate this instrumental, shred guitar music from start to finish. And fans of instrumental rock guitarists like Yngwie Malmsteen, Joe Satriani, Steve Vai, Tony MacAlpine, Joe Stump, etc. will thoroughly enjoy this album! Two Roads is a track from my 2005, 80s style Christian rock/metal demo, Rock You Up. This song is a straight up presentation of the gospel. Jesus has paid the price for our sin—and He offers us love, forgiveness, grace and relationship with Him for eternity------to receive this is the BEST CHOICE a person can make—to reject it is the most tragic. I hope the song totally Rocks You Up for Jesus! Enter Sandman, from the album “METALLICA,” was a HUGE hit for the metal band, Metallica. I totally loved this song! With James Hetfield on guitar and vocals, Kirk Hammett on guitars, Jason Newsted on bass and Lars Ulrich on drums, this band rocked hard! I know I had a blast honoring these musicians and re-envisioning the message of this classic metal song with a Christ-honoring message. Fans of Christian Rock and Christian metal will enjoy this one! I hope it totally Rocks You Up! This song is part of the album, Storm The Gates 2, available everywhere! Peace Sells was a HUGE hit for the thrash metal band, MEGADETH. I totally loved this song! With Dave Mustaine on guitar and vocals, Dave Ellefson on bass, Chris Poland on guitar and Gar Samuelson on drums, this band rocked hard! I know I had a blast honoring these musicians and reinventing the message of this classic metal song with a Christ-honoring message. Fans of Christian Rock and Christian metal will enjoy this one! I hope it totally Rocks You Up! God is God is part of the album: Storm The Gates 2, and is available everywhere! Be sure to visit and subscribe to the Pastor Brad Rocks YouTube Channel today at: https://www.youtube.com/user/pastorbrad1985 And tell your friends! JESUS, He's the Best -- is an 80s Christian Metal anthem from my 2004 demo, "Get Real". The song loudly and proudly proclaims the supreme awesomeness of Jesus. Remnants of my testimony surface throughout the lyrics... I hope you can relate and that the song totally Rocks You Up for Jesus! Judas Priest - Christian Parody - You've Got Another Thing Coming! Dude, I will never forget this album---I wore my turn-table out on this one! When I got the chance to honor the musicianship of JP & at the same time to honor my Lord with this parody--it was a pure joy! I hope it totally Rocks You Up for Jesus! Balls To The Wall was a HUGE hit for the German Metal Band, ACCEPT. I totally loved this song! With Udo Dirkschneider on vocals, Wolf Hoffmann on guitar, Peter Baltes on bass and Michael Cartellone on drums this band rocked hard! I know I had a blast honoring these musicians and redeeming the message of this classic metal song with a Christ-honoring message. Fans of Christian Rock and Christian metal will enjoy this one! I hope it totally Rocks You Up! GET "Storm The Gates 2" for FREE Until Easter 2017! 10 classic metal songs from the golden age of metal--parodied from a Christ-honoring perspective. It's the absolute BEST of two worlds----classic metal -- with a faith building message! Storm The Gates 2 will be released world-wide on April 1st, but because you stopped by GuitarJams.Net--you have an opportunity to get the album for free! Now through Easter (April 16) everyone who subscribes to the Pastor Brad Rocks Newsletter will receive the entire Storm The Gates 2 album -- with cover art -- FREE! WATCH THE VIDEO FOR A TASTE OF WHAT YOU'LL RECEIVE. THE STORY behind the song and the album called, "TELECASTER." It was a crazy, intense, maybe even a little bit unwisely busy season of life----but one of the great things that came out of it was this collection of 12 80s Style Christian Metal songs. I hope this story and the song totally ROCK YOU UP! Do you remember setting the needle down on Dokken's "Tooth & Nail" for the first time---and hearing WITHOUT WARNING swell into full volume with all of it's emotion, drama and technical prowess? It was just a classic 80s guitar monster rock track. Well, this is my cover of this amazing piece of rock music history... enjoy! BTW: Full credit to Jeff Garner who handles lead guitar duties on this one! Check out his guitar lessons HERE. If you love Jesus, enjoy great modern worship and also hard rock / metal music, you’ll totally dig this hard rock version of EVERLASTING GOD! NOTE: “Everlasting God” is my performance of a song written/composed by Tom Fettke and Ken Bible. The version that inspired me was performed by Lincoln Brewster. I had a blast recording and producing it—I hope ti totally Rocks You Up for Jesus! Storm The Gates - FULL ALBUM - Christian Parodies of Classic Metal Hits! Alright friends---Here ya go! 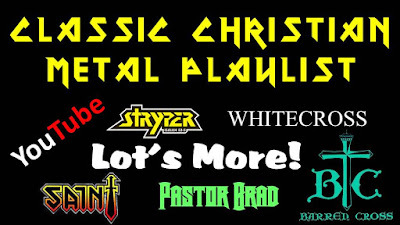 40+ minutes of Classic Christ-Honoring 80s Style Metal Music! Storm The Gates is available at iTunes, Amazon, Spotify and lots of other music outlets! TRACK LIST Jesus Rock Solid -- parody of Detroit Rock City, by KISS Son of Man – parody of Iron Man, by Black Sabbath (3:48) Living Fountain – parody of Man on the Silver Mountain, by Rainbow (8:19) Touch of Love – parody of Touch Too Much, by AC/DC (12:35) Rockin For The Good News – parody of Living After Midnight, by Judas Priest (16:53) Jerusalem 3 pm – parody of Dallas 1 pm, by Saxon (20:26) The Dragon is Slain – parody of Crazy Train, by Ozzy Osbourne (27:01) Jesus Said – parody of Metal Health, by Quiet Riot (31:37) Freewill – parody of Say What You Will, by Fastway (36:39) Storm The Gates is a collection of classic 1970s & 80s hard rock / metal songs that rocked my face off in “the day.” It was such an honor to redeem these hard rock classics for Jesus! Each parody – I believe – captures the sound and feel the original song—but with Christ-honoring lyrics designed to encourage you in your faith walk with Jesus.